Yesterday was the time for deciding for Knox County Commission on selecting a colleague to represent the Eighth District. There were 8 applicants, Terry Wilshire was out of town on business. Former Black Wednesday County Commissioner Phil Ballard withdrew. 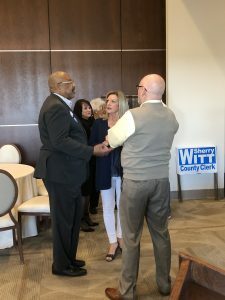 Also Michelle Westover attended but she also withdrew. Douglas Iglehart, Krystal Gibson, Richie Beeler, Rebecca Longmire and Sonia Suzanne Sanders were all nominated. Iglehart and Gibson got no votes on the first ballot and they were taken off. The next vote was Beeler 4, Longmire 3 and Sanders 3. There were several votes were it was deadlocked 4,3,3. It was almost a flashback to Black Wednesday January 31, 2017 where a vote was deadlocked. They allowed the three candidates to speak and Larsen Jay asked them a question about private sector experience. Eventually, Chairman Nystrom voted for Beeler, making the vote Beeler 5, Sanders 3 and Longmire 2. So Longmire fell off and the next vote was Beeler 6, Sanders 4 and Beeler was selected. There ya go, Congrats Richie! It was refreshing to see so much interest in the Eighth District. In the past the district has had few challenges, electing people with similar theologies. This candidate pool had nearly every generation represented. Younger folks like Gibson and Gibson give hope that a new day may be dawning for the Eighth District.